The last few months have been full of friendly appearances at other sites and publications. 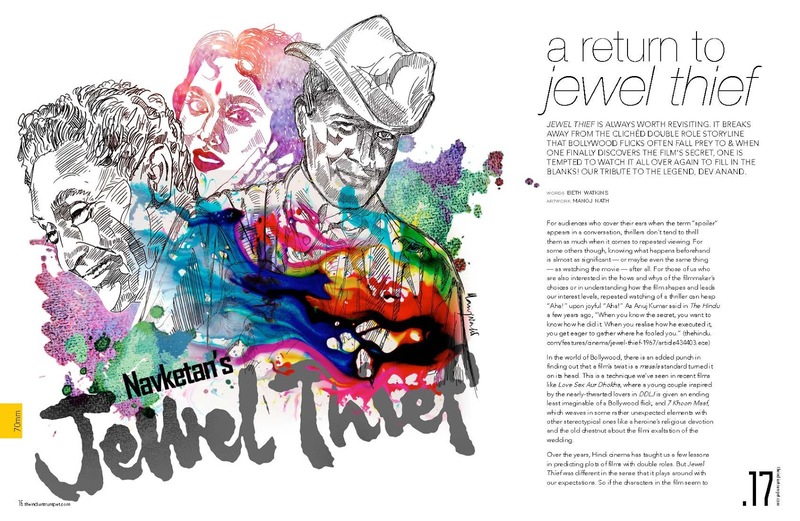 The latest is an essay on Jewel Thief at issue 2 of The Indian Trumpet, specifically on why I think this film that has so many unknowns and so much suspense and mystery is a joy to watch long after you already know what happens. It is available in the lovely online version of the magazine here (flip to page 16) or as a pdf here. This is an excellent article, written with a greal deal of perceptiveness. I enjoyed reading about all the points --- the style of Jewel Thief, the analysis of Ashok Kumar, the escape to a foreign locale, the modern women characters, and the direction and intentions of Vijay Anand. Ashok Kumar elevates this movie into an all-time classic, and just like you, I do wonder as to why the industry did not make use of him in similar roles. "After spending so much time in the company of such great actors, one does learn a bit of acting". Dev was always considered an acting lightweight in comparison to Dilip Kumar/Raj Kapoor/Ashok Kumar; and this is his tongue-in-cheek response :). In many ways, it probably is Dev's recognition of all that Ashok Kumar had done for him; I am referring to how Ashok Kumar gave Dev his first big break in films. Arguably, this was one of the first Indian movies to be recognized abroad for its style; most earlier ones were always about the culture/ethos/shall we the "resource challenged" nature of Indian society. I am not sure whether there is a later movie that makes a greater stylistic impact. Again, glad to have read this piece. Thanks, Samir! :) I assume pretty much no one needs to be convinced that Jewel Thief is worth a re-watch, but I aways enjoy a chance to celebrate films that hold up no matter how many times we see them. Just to let u know that I am a fan of your Bollywood site.